Thanks Chief! I certainly enjoy your posts as well. I'm glad we have this forum to share and talk about our experiences. Are you still slaying the Crappie? You're a true outdoorsman and my kind of people! Sold mine at the very end of November, and was pleased. Glad to hear you guys got a good price for your effort. Well, it's been pretty down right cold around here for the most part. Had some pretty good snow up in the mountains, but not much down here in the valley yet. Going deer hunting in the morning. I've seen a lot of deer mostly does, and small bucks. We've had some really nice bucks on trail cam pics, but they have managed to elude me, lol. My uncle killed a decent little 8 pt. Times about to run out, but it's been a pretty exciting season for the most part. Looking forward to September already. Stay warm fellas, and have a great Holiday! Hey 44! Keep after that big buck, you might just put him on the ground yet! Lol I'm glad you did well on your Seng bud. Merry Christmas brother and you stay warm! way to go chief!, A lot easier than diggin ginseng that's for sure. I play those things quite a bit, maybe to much, lol. I've had couple nice wins. 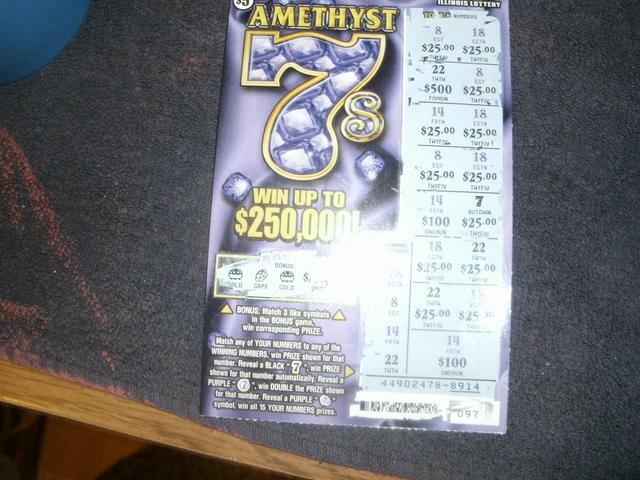 About 13 years ago I stopped after work and bought a 5 dollar scratch off and won 10k, and i've been hooked ever since. I stop in there like clockwork to buy those things. I had a real heart breaker back in the summer. I stopped just down the road from the house to buy couple 10 dollar Jumbo's, and the very next day I walk in and guy behind the counter told me the very next guy that bought a ticket off that roll won 300k! He was telling the truth too, later saw where he had won. They have a 300k winning ticket banner in there. Man that was hard to take, lol. Congrats on the win! Atta boy Chief!!! CONGRATS! I play a few every now and then. My best win was a $1000 on a $20 ticket a few years ago. Oh my 44, I would've been sick over that. Lol The 10k win was awesome! I just scratched two $10 Jumbo bucks an hit $20 on one. I buy a few every week. Good luck on future scratching! You too Ub, I know what you mean about being in the hole. I'm in the hole and already been covered up, lol. What's weird is i'm the only gambler in the family. The rest of em wouldn't touch it with a ten foot pole. They're fun, but boy they are addicting.